Block Cipher is an encryption method where the encryption algorithm operates on a plaintext block of n bits and produces a block of n bits ciphertext. Block Cipher has 2^n possible different plaintext block to encrypt. Nonsingular Transformation means the encryption algorithm must be reversible (Nonsingular) to decrypt the ciphertext into the original plaintext. The ciphertext must be unique for each plaintext block. Encryption Block Cipher with a plaintext block length n=4 bits and ciphertext, with 2^4=16 possible input states. This algorithm is reversible (Nonsingular). There’s a problem with a small block size n in that this system is vulnerable to statistical analysis. Yet, if n is large enough, the statistical analysis will be much harder. Feistel proposed that we can approximate the ideal block cipher system for large n, built up by components that are easily realizable. This is the execution of 2 or more simple ciphers in sequence and the result is a strong encryption. The required form of this approach is to develop a block cipher with a key length = k bits, and a block length = n bits with a total possible transformation = 2^k rather than 2^n. Feistel Cipher consists of a number of identical rounds of processing. In each round, a substitution is preformed on one half of data being processed followed by a permutation that interchanges the two halves. The original key is expanded so that a different key is used for each round. 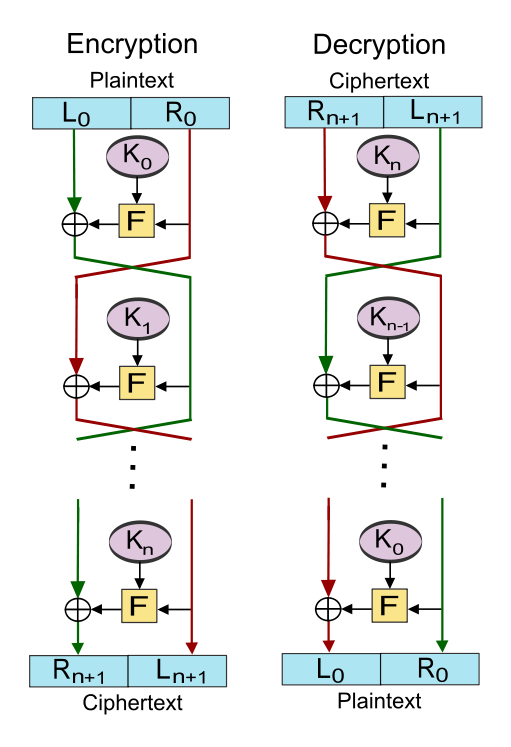 The Feistel Encryption Algorithm (the left hand side): inputs to a encryption algorithm are a plaintext block of length – 2w bits and key K.
The plaintext is divided into two halves Lo and Ro, which pass through n rounds of processing. Each round i has inputs – Li-1 and Ri-1. Then, they’re combined to produce the ciphertext block. The subkey Ki is derived from the overall K; Ki is different from K and from each other. 1- A substitution is performed on the left half of data by applying a round function F to the right half of data, then by doing XOR the output of round function F with the left half of data. The round function F has the same structure every round, but there’s a change in parameter subkey Ki for each round. 2- A permutation is performed, which consists of interchanges on the two halves of data. Feistel Cipher structure is form of substitution permutation network (SPN). Feistel Decryption Algorithm (the right hand side): inputs to decryption algorithm are ciphertext and subkey Ki but in reverse order. It starts start with Kn then Kn-1 ans so on until K1 in the last round. Note #1: At every round the value of encryption algorithm is equal to the corresponding value(n-ith) of decryption algorithm, but the two halves are swapped. For example, in a system with 16 rounds, the value of 5th round in encryption algorithm is equal to the value of 12th round of decryption algorithm, but L and R are swapped. Note #2: The round function F is not required to be a reversible function. 1- Block size: Large block size means greater, but reduced encryption and decryption speed. 2- Key size: Large key size mean greater security, but may also reduce the encryption and decryption speed. 3- Number of rounds: Increasing security can be achieved by increasing the number of rounds. 4- Round Function F: Increasing the complexity of round function F increasing the resistance to cryptanalysis. 5- Subkey generation algorithm: Increasing of complexity here also increases the resistance to cryptanalysis. Thanks and I hope this was useful to you! please make upload of this in video. is still Feistel Cipher is secure?